Lupiesoft is looking to create a bigger and better version of their 2016 yuri visual novel. Find out more about The StarGazers: Remaster!, which is now up on Kickstarter. Many of you are probably already familiar with Lupiesoft’s 2016 yuri visual novel release, The Stargazers. In our review, we mentioned that the title had a lot going for it, but the story was disappointing and it was held back by some bugs. Well, Lupiesoft aims to fix all of that by releasing The Stargazers: Remaster! Lupiesoft has some grand ambitions for their remaster, and they are turning to Kickstarter for support in this endeavor. First and foremost, The Stargazers: Remaster! is planned to have over five times the story of the original game. Hopefully this gives a much more satisfying ending compared to the cliffhanger we were left with in the original. With that longer story comes more characters, locations, and CGs. That’s not all, either: if the first stretch goal is met, the characters will also be voice acted by some renowned English voice actors. With this Kickstarter, Lupiesoft will expand greatly on the number of locations to explore, characters and groups to encounter, as well as delving deeper into the lore and history of the Stargazers universe. With successful funding of the stretch goals, the title will also receive voicing by some renowned English voice actors such as Lindsay Seidel (Psycho Pass, Baka to Test, Assasination Classroom), Megan Emerick (Tsugumomo, Keijo), Sandra Espinoza (Marvel Avengers Academy) Steven Kelly (Dragon Age: Inquisition), Marissa Lenti (Gamers!, Fairy Tail) and many more! 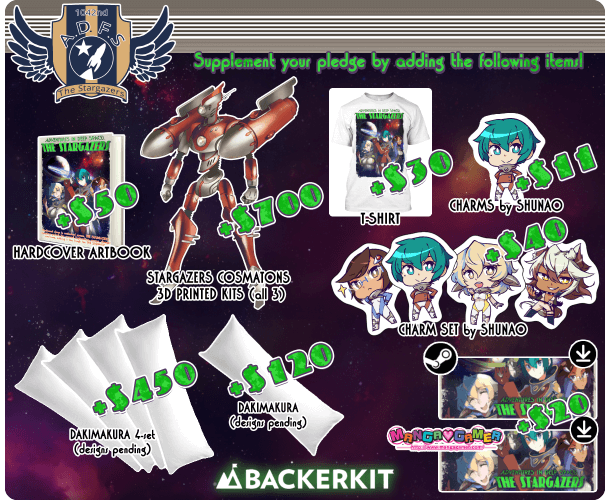 It wouldn’t be a Kickstarter without sweet swag and rewards, and this project is no different. 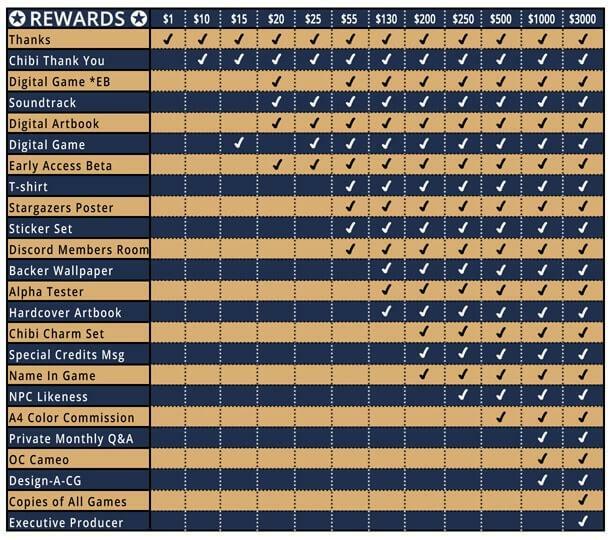 Some of the basic rewards include thank you art, wallpapers, artbooks, stickers, soundtracks, t-shirts, posters, beta access, discord access, and of course, copies of the game. 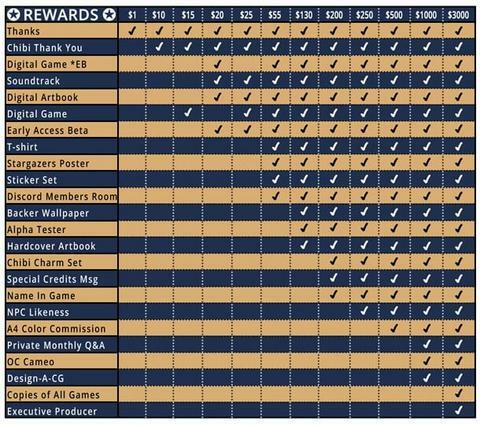 For those with deep pockets, you can expect even more, like charm sets, being in the game, custom art commissions, a custom in-game CG, monthly Q&A sessions with Lupiesoft, development access, and even copies of every future Lupiesoft title. Lupiesoft also has backerkit access and add-ons for those of you who like to customize your rewards or if you just wanted to snag a daki. You’re probably wondering what will happen if Lupiesoft surpasses their funding goal. As mentioned before, the first goal will unlock partial voice acting. This will lead to full voice acting if the third stretch goal is unlocked. 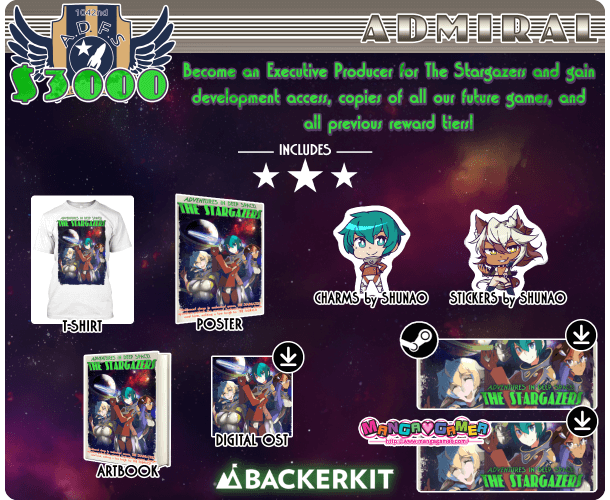 Before that, the second stretch goal will allow them to add an animated opening in The Stargazers: Remaster! The fourth goal will finish the story off with an animated ending sequence. For now, there are no set goals beyond $80,000, but the team at Lupiesoft is leaving their options open. There are still 29 days left in the campaign. If funded, The Stargazers: Remaster! will be available for PC, Mac, and Linux platforms. It’s scheduled to be released February 2018 on Steam and Mangagamer. You can check out the game demo for PC/Linux and Mac . If you’d like more information or you want to show your support, be sure to visit their Kickstarter page. For more news on lewd Kickstarter projects, follow us on Twitter and Tumblr. If you would like to help us create more content, consider donating to our Patreon.